There's been a little discussion of a non-peer reviewed (so far) paper published by Anthony Watts et al. claiming the warming at the best-sited US weather stations is two-thirds' that estimated by NOAA for the US based on the entire adjusted weather station record. Sou at HotWhopper (linked above) points out that Watts can't explain why a heat sink or a reflective surface at a station would produce not just a different temperature but a different trend over time. A station with a building next to it might be warmer - that's fine, but why would it then warm up even faster over time? Victor Venema repeats that issue and also finds fault with Watts' decision to accept one data adjustment while rejecting all others. VV critiques the reliance on potentially-flawed station history metadata to assume a well-sited station has always been well-sited, pointing out that those stations could have been cross-checked with nearby stations. Meanwhile, Watts is holding back on the source data, saying he'll release it only after publication. The other point is that it appears that the researchers didn't categorise the weather stations strictly according to Leroy (2010). As far as I can tell, they only categorised them on the proximity of "heat sources or reflective surfaces (buildings, concrete surfaces, car parks etc)". There was no indication that the researchers attempted to group them according to the other criteria described in Leroy (2010), which were the slope of the land, the vegetative cover, proximity to water, and shade. So they exclude siting factors that might make the station warmer (still unclear on why that would result in a different trend) but they include as okay siting factors that might make a station cooler. Vegetative cover and shading in particular might get more significant over time, so maybe that helps explain the differential. What’s more troubling, is that similar siting problems have been observed at weather stations around the world, meaning the global warming present in the surface temperature record may be overblown. Watts’ study comes after NOAA published a June study making further adjustments to temperature data and purported to eliminate the “hiatus” in global warming. Watts’ new paper casts more doubt on NOAA’s temperature adjustments — which always seem to increase the warming trend. Correcting for these poorly-sited stations could also bring surface warming trends more in line with observations from satellites, which show no statistically significant warming for about two decades. Emphasis added, and nothing Bastasch wrote that is emphasized is actually in the Watts' work that he's reporting. So either Bastasch pulled the global implications of the study out of his own pocket, or somebody he interviewed (Watts?) decided to speculate. Watts made no attempt to interpret global data, the vast majority of which is ocean data anyway, but if this study was somehow right and somehow had global implications, then the implications is that the globe is warming pretty fast. Watts would be out of the mainstream but still closer to the mainstream than denialists running for the Republican nomination and anyone else who says satellite data prove that surface temps aren't warming. Sou found one of Watts' commenters who noticed this, but Watts himself hasn't. Finally, strange that the planet wouldn't be warming and absorbing more heat but still (as Tamino says) still confronting steadily rising sea levels. Why is that happening? And why are the vast majority of glaciers melting throughout the last two decades? First, Watts et al data only goes through 2008 - they don't even attempt to run it up to today. I wonder why? Surely they've looked at it, but don't find it worth mentioning? Second, USHCN is actually running cooler (at the moment) than USCRN. If they disagree with USCRN as well, then what explanation do they have for that? USCRN should have siting even better than the "unperturbed" subset they've selected and USCRN has no station moves and no instrument/sensor changes. Third, a year and a half ago Evan Jones was assuring us that their physicist co-author said the physics of the heatsink hypothesis would be "easy to nail" - now Evan admits they don't have a physical explanation. Fourth, if they actually implemented the LIG to MMTS conversion as Evan describes, then they've lost most temporal and spatial resolution. They've also likely understated the MMTS correction by applying the average for the whole dataset to a specific subset - a specific subset that should require a much larger correction. Watts can't explain why a heat sink or a reflective surface at a station would produce not just a different temperature but a different trend over time. Of course he can, it's a policy-driven deception. But for that we have dog whistles. Why is John Nielsen-Gammon involved with this exercise? I'm not sure Watts & Co. understand how weather stations work, overall, and I'm unconvinced that they understand what "nearby" heat sinks or sources might actually do to alter readings. I can't speak universally for all of his stuff. I've seen photos he's got of a formerly rural site in California that is now at a rather busy suburban-to-urban intersection, and that one site may well have been affected by exhaust from a nearby window air conditioner -- but there was never an attempt to determine fine points there, such as whether readings were warmer when the air conditioner operated and wind would blow the presumably hotter air towards the weather station. In past discussions with Watts, before he banned me from his site, blocked me on Twitter (and probably every other social media platform available) he insisted that all airport are urban heat islands (UHI), and he assumed that all such sites would produce errors. Having spent some time working airport management for an airline, and having been on dozens of runways and taxiways at dozens of airports in various climates around the world, I note that many airports, particularly in the U.S., probably shoudln't be classified as UHI. Baltimore's Thurgood Marshall Airport (BWI), for example, was constructed in a forested area, with much of the original forest kept as a kind of greenbelt to stifle noise and light pollution. The weather station there is on a strip of land more than a mile from the terminal, closer to two forested tracts. Is the forest significant? The airport has several hundred acres of forest, and employs at least one full-time forester to manage it. (At O'Hare (ORD), a suburban airport near Chicago, we used to have problems from a herd of deer that lived in the airport's forest; deer strikes were a constant hazard. Deer don't live in UHI, generally.) Watts argued that UHI heat from the City of Baltimore polluted readings at the station -- but the station is usually not subject to wind blowing from the city, across Baltimore Harbor, to the airport. When winds do blow from the north, it's likely the harbor moderates temperatures more than the runways do -- and despite Watts's claims the runway is suitable far from the weather station by NOAA standards. So I flinch whenever I hear that Watts has "categorized" weather stations. There well may be some stations whose temps are driven up by heat from UHI, but there is no research to support a claim that airports, even big, busy airports, are urban, or heat islands that mess up temperature readings. If you think of LaGuardia's (LGA) water location next to a National Wildlife Refuge, Denver's (DIA) location far outside the city on the high plains of Colorado, DFW's now-suburban location, but with hundreds of acres of farmland and scrub forest as buffer from the burbs, Salt Lake City's (SLC) location on the edge of the Great Salt Lake, you may begin to see my concern with the possibility that Watts & Co. may miscategorize stations, and draw incorrect conclusions from such miscategorizings. I hope he's more careful than that, but it's hope contrary to my experience. A bit off topic but i was wondering if there has ever been an attempt to use temp data from commercial aircraft. There must be a lot of data recorded somewhere up to 38-40,000 ft.
Oh, and then there is this: Watts usually rather assumes that UHI readings are "inaccurate." Airline experience, again: Pilots and their support folk at the airlines know well that UHI can upset stability of aircraft overflying such a city. Seems that the heat is not imaginary, but is in fact real, and moves air. Let's assume for a moment that UHI push up some NOAA site weather measurements. I am not convinced that is not an accurate reading of the temperature. Non-imaginary heat should raise the temperature of the planet a bit, on average, if it's enough to push a 747 around. Evidently the system needs a bit of tweaking. But at least we are now coming to closure on that insulting "denier" bs. It seems "denier" now means disagreeing with the establishment mantra to the nth degree? No, Fernando, calling deniers what they are is not going away. Watts is still a denier, despite this latest foray into faux science. @Neven: "Why is John Nielsen-Gammon involved with this exercise?" Good question. N-G has always had an odd sort of paternal attitude towards the world of deniers. If he believes he can lead them to seeing reason, he has sadly mistaken their motivations. Note that AW works at KPAY radio. Does he spend most of his time in the building surrounded by gravel and asphalt or does he spend his time in the open field where the transmitting antennas are? At "home" does he live outside away from buildings, or does he sleep inside (a building/house)? Where do his listeners/ readers spend their time, inside or near buildings, or out in the wild? If all of his followers live rough in the wild, then his exclusion of weather stations near heat sinks is justified. If he or any of his followers work or live in or near buildings or roads then he is a hypocrite. FL, deniers deny. Climate science deniers deny the demonstrably defensible facts of climate science. There must be a lot of data recorded somewhere up to 38-40,000 ft. I've wondered this myself. This old weatherman used to see a lot of pireps come through, and many contain temp and altitude and time. Looking at Watts' graph, it's clear that there was no difference before 1991, and again very little difference after 1996, and that the entire shift occurred between those years. Since it is quite unlikely that the physics of concrete changed during that period, Watts et. al's explanation for the difference is certainly wrong. More likely was that some stations made a direct leap from CRS to ASOS in this period, bypassing MMTS entirely. These moves would not have been caught by Watts' procedure, and would have infected his data. We may never know for sure, because if he doesn't pass peer-review he won't release his data. Eli: "There's been a little discussion of a non-peer reviewed (so far) paper published by Anthony Watts et al." I feel, our scientific rabbit is a little too generous. This time there is not even a manuscript to come with the press release. Thus I would not call it a "paper". A poster, blog post, press release, study would be good alternatives. My main problem is that the authors only know the siting quality at the end of the period. Stations in the compliant categories may have been in less well sited earlier on, while stations in the non-compliant categories may have been better sited before. That would produce trend biases in the direction found. The example of pete shows very well why that is a problem: Someone has a weather station in a parking lot. Noticing their error, they move the station to a field, creating a great big cooling-bias inhomogeneity. Watts comes along, and seeing the station correctly set up says: this station is sited correctly, and therefore the raw data will provide a reliable trend estimate. This seems me to be the most likely reason for a trend difference between the siting quality categories. The difficulty is that this problem is nearly impossible to solve within their study set-up. It would make it a little better to extend the data to 2015, that would make the assessment of the siting quality a bit more in the middle of the dataset. If they had an idea of how siting could "amplify" trends on decadal scales, but not on shorter or longer ones (like they found), that would theoretically help. Having a hypothesis and studying its consequences would allow one to ask the data more complicated questions than just comparing trends. Michael Bastasch at the Daily Caller:"The National Oceanic and Atmospheric Administration’s reliance on poorly-sited weather stations to calculate surface temperatures is inflating the warming trend of the U.S. and maybe even the rest of the world, according to a landmark study...."
Expect that Roger Pielke Sr. as part of his review for the UK political pressure group the GW Policy Foundation will show lots of photo's with badly sited stations all over the world. With 32 thousand stations in the ISTI dataset and likely many more maintained by other organisations than weather services it should be easy to find a nice suggestive collection of photo's. If someone has time it might be nice if someone would look for photo's of well sited weather stations. People are visual beings. The photo's of the stations of the Dutch weather service, KNMI, look so nice that you could describe them like Donald Trump describes himself. Personally, I would not be surprised if the siting of weather stations has improved the last decades globally. With modern automatic weather stations you have much more freedom where to place them and can thus select better locations. With a group of colleagues, I am collection parallel measurements to study the influence of relocations and the introduction of automatic weather stations. If anyone has such parallel datasets, please contact me. Eli: "Watts made no attempt to interpret global data, the vast majority of which is ocean data anyway"
Which makes it so funny that The Daily Caller connects this to the NOAA article. But you have to stick to the right wing talking points. If your right wing peers are bashing NOAA, you should also bash NOAA, also when it makes no sense whatsoever. Many years ago Eli noticed Willard Tony's need for a time machine and that Tom Karl had a better idea with the USCRN that could be used as a cross check on the USHCN. Neven: "Why is John Nielsen-Gammon involved with this exercise?" No idea, but it is good that they have one person in the team who has a reputation to lose. Watts' press release suggests the manuscript is being submitted. I would be surprised if N-G would be willing to support the stuff from the press release with his name. It may thus take a little longer until submission and likely the manuscript will not be too different from the previous Watts' micro-siting paper: Fall et al. Also interesting that Roger Pielke Sr. does not appear on the author list as father of the project. Ed Darrell: "Having spent some time working airport management for an airline, and having been on dozens of runways and taxiways at dozens of airports in various climates around the world, I note that many airports, particularly in the U.S., probably shouldn't be classified as UHI." If I recall correctly and if they have not changed it, then they have removed the airports from their dataset to study micro-siting. They do not talk about the ASOS automatic weather stations, which are typically installed at US airports. The results for airports may have been inconvenient. Ed, do you know of a list of "all" airports in the world (with weather stations)? Alternatively, do you know of a way to contact meteorologists working at airports? The relocation to airports will have been a cooling bias in many cases because the station was located in or near a city before. Some station may have been rural before, but typically people build airports near cities. Thus this is a transition that could potentially bias the temperature record. You see that in the 1940s, which was when many airports were build, there is a cooling bias in GHCNv3. Ed Darrell: "Let's assume for a moment that UHI push up some NOAA site weather measurements. I am not convinced that is not an accurate reading of the temperature." The warmer temperatures in cities are real. The problem is that only a small part of the Earth is covered by urban areas. Especially the high-rise areas that give the UHI. A larger percentage of stations is located in cities. That is the reason to study whether this leads to a warming bias, which apparently does not happen much. One reason for this may be that urban stations are often relocated to better locations. That many stations are in cities is because this is often were the measurements started, in the past thermometers were expensive scientific instruments and the educated people who would use them often life in cities. And meteorological services need to make good predictions were most users of their predictions life. The flip side of that is that because more stations are located where people live, these stations also get a smaller weight when computing a large-scale spatial average temperature. You often see mitigation sceptics make a normal average, rather than compute an interpolated field to compute the average because this gives a too high weight to the urban stations, which fits to their political narrative. Unknown: "A bit off topic but i was wondering if there has ever been an attempt to use temp data from commercial aircraft. There must be a lot of data recorded somewhere up to 38-40,000 ft."
Yes, they are used, especially in meteorology to determine the current state of the atmosphere, which is the begin of any weather prediction. The WMO gives a good introduction. Aaron, we really need good measurements of the large-scale air temperature for the validation of weather prediction and climate models. The air temperature needs to be well defined to be able to compare them to predictions and each other, that is why the weather services try to assure good siting of the weather stations. To study climate change this may be less important as long as nothing changes, but also in this case you would prefer temperature to be temperature and not influenced by sun, vegetation, soil moisture and wind as well. The additional effects from urbanization need to be studied separately. They have different causes and can be influenced in different ways. KAP: "Looking at Watts' graph, it's clear that there was no difference before 1991, and again very little difference after 1996"
Yes, it is interesting that in the last 20 years not much is happening in the difference between the two categories. Likely because here we still know most of the changes in the observations. Before 1996 the situation is a little more complicated. In my (updated) post I have a figure of the difference, courtesy of George Bailley. KAP: "More likely was that some stations made a direct leap from CRS to ASOS in this period, bypassing MMTS entirely." Interesting idea. Also interesting in this respect is that stations that never had a change of screen (and less likely a change of location) and still use a CRS had the highest trend and nearly the same trend as the homogenized data. Something Watts et al. did not emphasise. EliRabett: "Many years ago Eli noticed Willard Tony's need for a time machine and that Tom Karl had a better idea with the USCRN that could be used as a cross check on the USHCN." Watts et al. have a little time machine. You can get older maps from Google Earth nowadays. The Google Earth Wayback Machine. Maybe that can be used to save their study, if they can find enough older data and are able to compute classifications in earlier times. 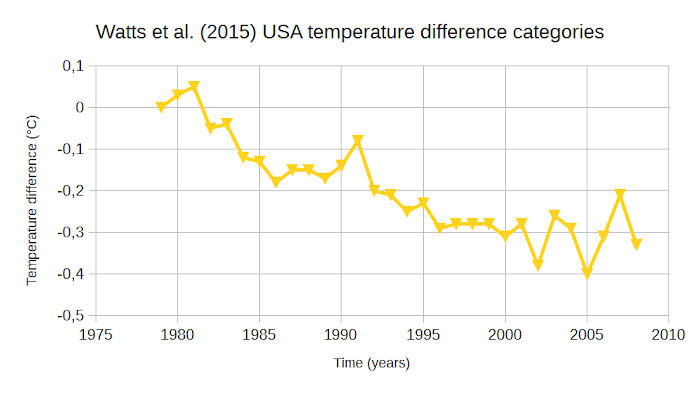 The US Climate Reference Network is wonderful. I wish we had that all over the world. That may be my next post. We are making a unique experiments with the climate system. The least we can do is measure it accurately. Now some, not Eli to be sure, if they were to look for metadata would seek out the USHCN stations that were run by families and go ask them for pictures taken over the years. FWIW USCRN was only commissioned in 2008. Perhaps that is why the Tony cut off his series in that year. "Ed, do you know of a list of "all" airports in the world (with weather stations)? Alternatively, do you know of a way to contact meteorologists working at airports?" Actually, I think there are few meteorologists working at airports. American Airlines used to have (probably still does) a massive meteorology operation for their entire system working out of a building near DFW, in Fort Worth. Those guys are well worth talking to, if you can figure out how to get through the corporate phone system. In a normal world, you could call the PR folks at get to someone with knowledge -- but my experience since I left is that they are quite stuck up, and you'd be lucky to get a call back unless you were with a major media outlet. I don't know of a current backdoor in, though I'm sure there are some. Once had one of the old guys from years back in a class, and he spent some time talking about the difficulty of forecasting years ahead, which AA did before beginning hub operations, before picking airports to hub from. Once that selection was made, they got down to forecasting times of afternoon thunderstorms in which months, around DFW, in order to plan their hub schedules for minimum weather impact. Sometimes those plans gang aft agley, as we know. FAA used to publish a list of all airports in the U.S. (I used the publications to code corporate travel destinations in projects at Ernst & Young.) I believe those lists also indicated whether an airport had a manned or canned flight service station, which almost always had a weather station as well, for aviation purposes. I got the publications from a GPO bookstore, and they were updated quarterly (you could subscribe). It's probably online. One might be able to get some information out of the publications department at Sporty's Flight Shop, which is usually staffed with pilots with a lot of knowledge about such stuff. There may be some way to separate those data out from the usual weather data sets NOAA and NWS uses, that I presume you're onto already. For the world? Check IATA. There website rather suggests worldwide data are collected and made available to pilots, already: http://www.wunderground.com/Aviation/?MR=1 Data may not be available directly from IATA, though. I thought the BEST group took care of all these concerns. Didn't they? Eli writes: "FWIW USCRN was only commissioned in 2008. Perhaps that is why the Tony cut off his series in that year." Kevin, oh yeah, there were stations that were completed and operating well before 2008, but the full system with the capability of monitoring weather throughout the US was only complete and tested in Sept 2008. Since then stations are/have been added in Alaska. 29 from memory. Get with it Canucks and Mexicans NA needs complete coverage. Yes but they came up with the wrong answer, the one that Watts et al didn't want. So they're now down in the weeds trying to make grandiose claims on minor niggling details, in an effort to thereby prove all the science is wrong. Get with it Canucks and Mexicans NA needs complete coverage. "My main problem is that the authors only know the siting quality at the end of the period. Stations in the compliant categories may have been in less well sited earlier on, while stations in the non-compliant categories may have been better sited before. That would produce trend biases in the direction found." The problem with this comment is that it is made post knowing the result. If you did not know of the result would you really be able to make your statements on station siting? No. It is a guess, not an observation, trying to explain a result you do not like. Some observations 1218/1219 stations chosen for USHCN. As Eli poignantly /pertinently observed some were "family run"
Little American battlers in the wilds of Alaska battling through blizzards at 6.00 am each winter to record their observations not knowing it was at the wrong time. Some may have stayed in bed drinking whiskey and rerecording last years results. Years of attrition took their toll and a lot of the original family stations have closed down or turned into distilleries. Some areas did not have sites in the right area for the grid, composite stations were created with information from nearby real sites to create a station. Bad weather, and maintenance problems mean that 25 sites a month are out of action in Summer and up to 100 in winter. The sites chosen by Watts are I believe meant to be original or "pristine" from inception of his study. Hence I believe the substance of Victor's concern is unwarranted. None of the sites used in the compliant sites have been resited. That is why there are only about 400 of them. I am happy to be corrected on this if wrong. I think it is great that the study has been done and that you should all be happy that work has been done on station siting in a scientific way, whether by a skeptic or a warmist. Shooting the messenger or ignoring the message because you do not like the result is understandable but not scientific. Angech: Watts doesn't know the stations haven't been resited. He's relying on the metadata history, which can be wrong. Victor said he could've homogenized with neighboring stations but failed to do so. And as I said, the inferences that this applies globally, including to ocean surface temperatures, just contradicts with the assertion that satellite measurements disprove surface warming. The denialists need to choose their argument. It would be hard for me to warn for a buggy method before someone uses it. In science it is allowed to critique the work of others. Brian: "Watts doesn't know the stations haven't been resited. He's relying on the metadata history, which can be wrong. Victor said he could've homogenized with neighboring stations but failed to do so." Exactly. They do not even have to homogenize. All they have to do is detect breaks by comparing their stations to their neighbours to see if they these stations really are as "unperturbed" as they claim. If you use a method which can easily produce problems, you have at least to study how bad the problems are and try to minimize them. PaulS: Just went through USHCN stations for California and Nevada using the Berkeley site and can find no stations without multiple documented changes which would support the low 0.04K/Decade trend in raw data indicated by Watts et al. for that region. The only low trend station which might fit the bill as minimally perturbed is Santa Cruz (only one TOBS change), which has about a zero trend over 1979-2008. However, the trend in the final adjusted product for this station is also about zero - it isn't representative of the whole region, just this coastal zone. dhogaza added:And Santa Cruz sits right on Monterey Bay with all the climatic implications one might imagine. Very detailed statistics... thanks for sharing! Have a great week ahead.